How much does it cost to travel to Heraklion? How much money will you need in Heraklion? The average price of a hotel for a couple is €186 ($211). Additional pricing is in the table below. These average travel prices have been collected from other travelers to help you plan your own travel budget. The largest city on the island of Crete, Heraklion on first glance is almost completely modern  a frenzy of traffic, concrete, and dust. Do not expect pristine beaches and glittering waves (those can be found on other parts of Crete). Heraklion is first and foremost a city. Once you get past its grittiness, you will find that there are some attractive features beneath first impressions. The antiquity of the place lies embedded in the modern and is presented in one of the best museums in Greece, the food is excellent, and the people are friendly and welcoming. And though the sea is not great for swimming, its presence along the Venetian port will take you to another time if you need a break from Heraklion's bustling center. The Koules Venetian Fortress is Heraklion's main landmark. This 16th century fortress and its surrounding structure embody an impressive stone mass of solid walls that have stood the test of time. The fortress is open to visitors who wish to see up close the restored reliefs of the Lion of St. Mark, or enjoy views from above on the turret and roof. Examples of similar Venetian architecture exist in various places throughout the city. The Venetian Loggia, now Heraklion's city hall, is a two-story Venetian mansion, which used to be a meeting place for the nobles of Crete in the 15th Century. There are also many fountains of the Venetian era still preserved in the city, such as the Bembo fountain, the Priuli fountain, Palmeti fountain, Sagredo fountain and Morosini fountain (located in Lions Square). Other notable landmarks include statues and sculptures commemorating significant events and figures of the island's history, like El Greco, Vitsentzos Kornaros, Nikos Kazantzakis and Eleftherios Venizelos. One of the best ways for navigating Heraklion is to start at 25is Avgoustou Street (25th August). Repaved as a pedestrian street, there is very little car traffic and the place is lined with shops, cafés, restaurants, bars, and bakeries. This is the hub for commercial activity. The road begins with a view of the sea, and as you walk inland, the denser the buildings become. Amidst the shops and eateries you may stumble upon the beautiful church of Agios Titos or the famous fountain at Lion Square. The further you explore the more you will begin to see the enchanting antiquity beneath bustling modernity. The top museum in the city is by far the Archaeological Museum located on a corner of Eleftherias Square. Just walk down Dedalou off of 25th August and it will lead to right to the square where the museum is located. The museum spans a period starting several thousand years ago, through the Minoan, post-Minoan and later periods with findings from Knossos, Archanes, Phaestos, Zakros and many other archeological sites in Crete. A few highlights include the Phaestos disc and famous leaping bull fresco, but the museum holds a plethora of artifacts from Hellenic and Roman sculptures to ancient coins, jewelry, wall-paintings, and pottery. This museum is a major highlight of Heraklion and can easily occupy a few hours of your day. Located just about 20-25 minutes from Heraklion's center is the archaeological site of the Palace of Knossos. A major piece of Minoan history, the excavated palace is great way to experience walk through the Bronze Age. Much of the place had been well-restored by English archaeologist Arthur Evans starting in 1900, which gives visitors today a visual of the vibrant colors and frescoes used in Minoan architecture. A thorough exploration of the site is another activity that can take several hours, and further artifacts from Knossos can be seen at the Archaeological Museum mentioned above. Being a large city, Heraklion offers just about any kind of food from Starbucks to traditional Greek cuisine. As mentioned before, 25th August Street will have more than enough dining options for you to choose from. Anywhere around Lion Square offers a charming view of Venetian architecture while enjoying a bustling center of good eats. If you are looking to experience some of the local food culture, try the Atsalenio Wednesday market in Heraklion. Here you can sample all kinds of Cretan cheeses, from goat's to sheep's, mild and soft to earthy and hard, and even some fried varieties that will melt in your mouth. The market also offers all sorts of fresh vegetables and baked goods. And do not forget the olive oil. With over 15 million olive trees, the island of Crete uses olive oil in just about everything. Being the largest city on the largest island of Greece, there are many ways to reach Heraklion. By air, one can fly to Nikos Kazantzakis International Airport located about 5km east of the city center. The airport has a bank, an ATM, a duty-free shop and a cafe bar. By boat, one can take a ferry from the port of Piraeus in Athens. Minoan, Anek and Blue Star all operate daily between the two cities. 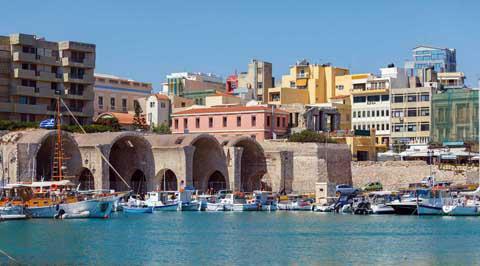 The ferry port of Heraklion is located about 500m east of the Koules Fortress and old harbor. From Heraklion, Anek also has a weekly service to Karpathos, Kasos, Milos, Rhodes, and Santoriniand Hellenic Seaways goes to Mykonos, Paros, and Santorini daily. Once you are on Crete, you can navigate the city's center by foot, or hail a taxi if you wish to see Knossos or any other part of the island. There are operating taxi stands located all around Heraklion. As far as buses go, there are three main bus stations. One provides local, city, and Knossos buses, while the other two provide transportation to just about anywhere else on Crete. K.T.E.L. operates the two regular bus services between the cities of Chania, Rethymnon, Heraklion and Agios Nikolaos offer the best affordable secure way to travel Crete.